As the producers of this year’s 39th Daytime Emmy Awards are working fast and furiously to bring the show live for the first time this year on HLN ( Saturday, June 23, 2012 at 8 p.m. ET), the telecast had just announced the first presenters confirmed for the big night. As you know, the Daytime Emmys recognize outstanding achievement in all fields of daytime television production and are presented to individuals and programs broadcast from 2:00 a.m. – 6 p.m. Barbara Walters will present this year’s Lifetime Achievement Award to Bill Geddie, Executive Producer of The View. Also on board are: Days of our Lives Hope Brady, Kristian Alfonso, CNN and syndicated talk show host, Anderson Cooper, animal expert, Jack Hanna, talk show host and cooking expert, Rachael Ray, Caroll Spinney (best known as Big Bird or Oscar the Grouch from Sesame Street) and the cast of talk show The Doctors are also set and confirmed to present. 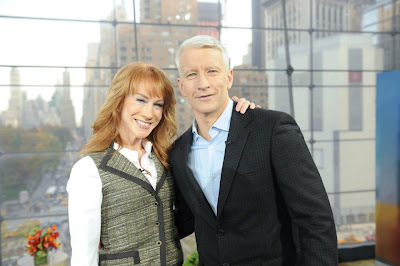 Below are upcoming guests on Kathy Griffin's talk show "Kathy" which airs Thursdays at 10pm ET/PT on Bravo. The series showcases Griffin's unique take on celebrities, co-workers, friends, politicians, and yes, even her own boxed-wine swilling mother, Maggie. Anderson is scheduled to be a guest on Jimmy Kimmel Live on Thursday, June 21st on ABC. Please check your local listings for the exact time. We'll have it covered for you. STATEN ISLAND, N.Y. -- Students at WFBN-TV, Monsignor Farrell High School’s very own television studio, recently had the pleasure of meeting Anderson Cooper, anchor of the CNN news show, on the set of his new talk show, “Anderson.” The young men, along with executive producer Brother Paul Hannon, interviewed the seasoned TV personality, and even got some tips about a career in journalism. In addition to meeting Cooper, the crew got to see Aziz Ansari, who spoke about his role on the show “Parks and Recreation,” as well as his own stand-up routine. In between commercial breaks, Anderson made a point of speaking to the audience, especially the students from Farrell. After the show’s end, seniors conversed with Anderson about their aspirations for the future and posed questions about the show. Anderson also spoke about his work as a war correspondent around the globe. 360 was pretty good tonite. I liked the piece about SPCA International charity. Its ridiculous that these "charities" are misusing funds. Also liked Anderson's interview with Jason Paracal and the follow up discussion. I'd also like to say that I prefer one big post like this instead of a bunch of little posts through out the day.Its easier to miss things when they're spread out through the day in multiple posts. It was great Anderson included a little info about CharityNavigator.org so people can check out a charity to see if they're any good before donating. Although the website doesn't include info regarding whether a charity is linked to Quadriga, it's still a good place to start. I'm a little disappointed Andeson talked to a Romney spokeswoman without countering her with an Obama person. Anderson asked a few good questions but the other side should have been present as well. The Ridiculist was pretty good; "Mr. Clean" is a real stupid a-hole. He blamed the indecent exposure charge on the too big pants his mother bought for him. Instead of deflecting the blame, he made himself look even more idiotic; he's roughly 50 years old and his mother still buys his clothing for him? Anderson appeared more focused today, no major flubs or mistakes. Gail Gitcho better get her act together before she speaks on news programs--she really got schooled by AC. I hope Jason Puracal is eventually released from prison, his story was scary and depressing. Jason Carroll's been doing a fine job reporting on the Sandusky trial. The Ridiculist was very funny, that guy was unbelievable. Looking forward to seeing AC on Kathy Griffin's show, it took a while for him to be able to do it. I am not looking forward to seeing Anderson on Griffins' program. These are two people who shouldn't be hosts. Let's hope by falls end, they will both be canceled.